Vancouver’s harbinger of all seasons, VanDusen Botanical Garden, is a delight to visit for the new blossoms in the spring, full foliage in summer, and the bright bursts of colour in the fall. When winter approaches, the garden is adorned with over one million sparkling bulbs during the Festival of Lights at VanDusen Garden. This family-friendly festival features both indoor and outdoor activities and attractions, plenty of photo opportunities, holiday treats, and much more. Activities range from photos with Santa, the Dancing Lights show on Livingstone Lake, Jardins de Paris, Scandinavian gnome performances, VPL Tales from a Winter’s Night, Make-A-Wish candle grotto, toy train, sound house, and choirs performing certain nights. Since there’s so much to see and do, you’ll probably need some holiday treats and warm beverages. Dining and snack options include Truffles Café, Truffles Pop-up Café, Shaughnessy Restaurant, Santa’s Kitchen, Ms. Klaus’s Kettle Corn Kiosk, Rudolph on the Roof, Cin City Donuts, and Whistler Wood Fired Pizza. Follow VanDusen Botanical Garden on Facebook and Twitter for more information. New! 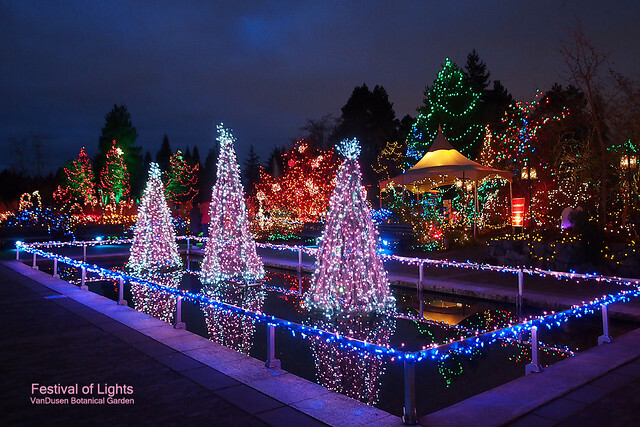 All Festival of Lights tickets include free entry to Enchanted Nights at Bloedel Conservatory. 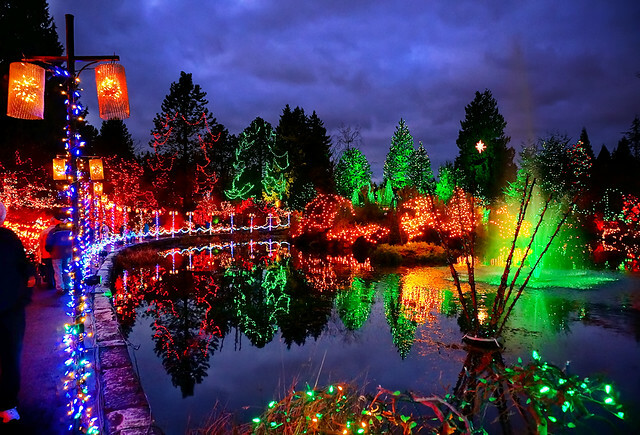 VanDusen is extending the Festival of Lights for a few weekends in January. It will be open January 8-10 and January 15-17, 2016.